Home / Feminism / #Berlin: Women’s Self-Defense: How and Why? 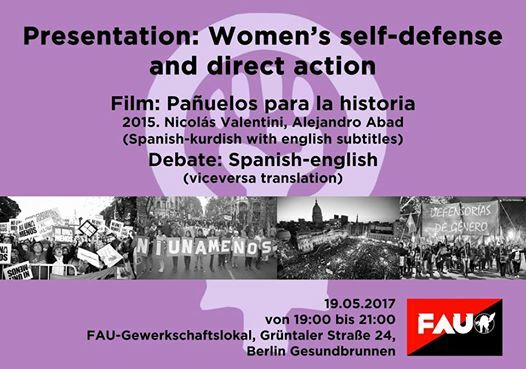 #Berlin: Women’s Self-Defense: How and Why? Film in: Spanish – Kurdish (Kurmanci) with english subtitles. Debate: Spanish and English (vice-versa translation aloud). Friday May 19th, 07:00pm, FAU-Gewerkschaftslokal, Grüntalerstrasse 24, Berlin Gesundbrunnen. Speaker: Mayra G. (Argentina), member of the solidarity committee with Kurdistan in Argentina, and of Defensorías del Género. Women’s self defense. How and why? The demonstrations of “Ni una menos” against sexist and masculine violence in Latinamerica mo­tivated us to self organize in “Defensorías de género”, in order to immediately finish the murders of women* and to encourage actions of self defense. We are still distant from “Ni una menos”; in fact, every day more women* are killed. The governments and the justice don’t react. After the legal measures taken in cases of “domestic” or institutional violence, we see that the goals of the justice are very different from ours. That encourages us to organize ourselves in self defense and direct action with the victims, independently from governments and political parties. We would like to establish the connections between our struggle and the struggles of the kurdish comrades with the film “Pañuelos para la historia” (2015, Nicolas Valentini and Alejandro Haddad). Film in: spanish – kurdish (kurmanci) with english subtitles. We would be pleased with an exchange with all the people interested in fighting patriarchal violence, in order to create international connections of feminist networks. All genders welcome! Gender neutral toilet. Film screening and debate are accessible with wheelchair, but the toilet isn’t L Childcare (for all ages) is provided. The demonstrations of “Ni Una Menos” against sexist violence throughout Latin America motivated the organization of “Desfensorías de Género” to encourage the self-defense against the killing of women*. We will also screen “Pañuelos para la historia” (2015), a film that establishes connections between the “Defensorías de Género” and the struggles of Kurdish women*. Languages: English and Spanish.